Remember 'My Cozy Corner's Living Room' Here Where the Old Fogies live! The other day I was looking in my November issue of Southern Living (page 62) and the designer and Southern style expert Phoebe Howard solved one of my most pressing decorating dilemmas. 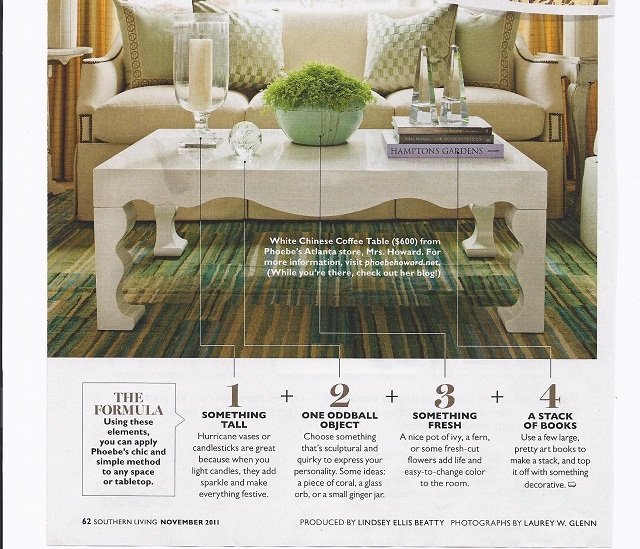 A foolproof formula for arranging a coffee table. #1 Something Tall - A candle sitting in coffee beans. #2 One Oddball Object - Two pair of vintage eye glasses. #3 Something Fresh - A friend of mine gave me a huge amount of succulents and I planted them in this pot. #4 A Stack of Books - That was the easy part. I have stacks of books on all my tables and under my tables. When I travel I love to read about where I'm going and when I return read about where I've been. Hopefully I will find a taller Hurricane vase to use for my Christmas Coffee Table vignette. If you are wondering what's in the box! It's a vintage 1930's Mah Jong set. It belonged to my Sweetheart's parents. I love to read English decorating magazines and they are right under the coffee table handy for me to pick up any time I need England fix or some inspiration on country living. I have always been an archivist and I have over 20 photo albums with old photos. My sweet daughter decided to scan all the original photos and place them in this large album with archival holders. Then as a Christmas gift last year she made a DVD of all the photos and gave a copy of the DVD her brothers and to us. The DVD covers 1960 to 1979. She is planning to finish the project after she gets her Master's Degree next year. With school, two young girls and working I can understand there is no time for scanning old history. I'm so grateful to have such a wonderful and caring daughter. Wow... Where did all that come from? 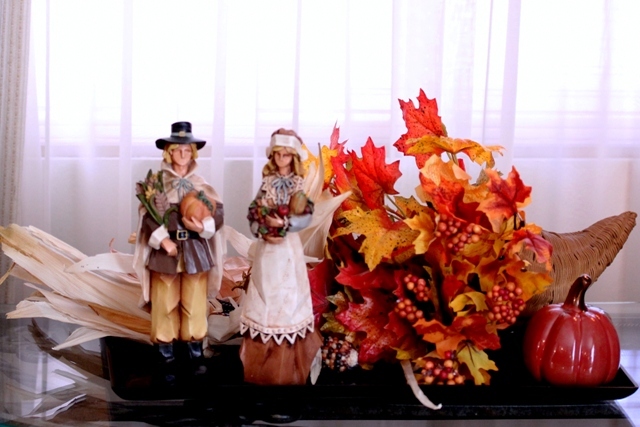 I changed the look of the mantel for a more Thanksgiving look. I love Mr. and Mrs. Pilgrims. Close up of the cute couple. And I love the Red Poppies. They remind me of the beautiful fields of England. I'm always so happy that you have come to visit My Cozy Corner. I hopping to some parties. Please come along and have some fun. You got that Southern Living Look down I would say. Impressive decorating job! I adore the pilgrims on the mantel.